BOISE, Idaho - With the threat of wildfire danger increasing throughout southwest Idaho, local wildland fire management agencies will implement Stage 1 Fire Restrictions, effective August 11, 2017 beginning at 12:01 a.m. They will remain in effect until further notice. These restrictions are intended to decrease the chance of any preventable fires in the designated areas. Stage 1 restrictions prohibit fires, campfires, or camp stoves in areas other than designated recreation sites with approved fire structures. Stage 1 also prohibits smoking in open areas except when stopped in sites that are free of flammable materials with a radius of at least 3 feet of barren soil or in developed recreation sites. Treasure Valley Fire Restrictions Zone – All of Ada, Canyon, Gem, Payette and Washington counties. Portions of Boise County including the administrative boundary of Lucky Peak Lake to Arrowrock Dam, south shore of Arrowrock Reservoir and that portion of Elmore County that lies south of the South Fork Boise River to Anderson Ranch Dam, south along Anderson Dam Road (FS Rd 134) to Highway 20, east on Highway 20 to the Elmore/Gooding County line south to Interstate 84. The Treasure Valley Restriction area is bounded by the Idaho/Oregon boundary to Oreana then follows the Bachman Grade to Triangle and continues east-northeast of the Owyhee Front to the Bruneau River. The northern boundary begins near Weiser, Idaho and follows Highway 95 to Indian Valley, then generally follows the Little Weiser River to the Payette and Boise National Forest boundary lines. 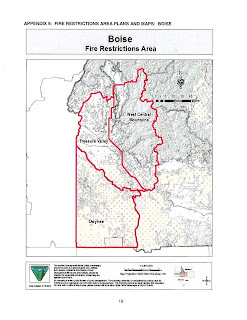 West Central Mountains Fire Restrictions Zone – Boise National Forest, Boise District BLM and State and Endowment Lands within Elmore County, Boise County, and Valley County to include all Bureau of Reclamation lands surrounding Lake Cascade. From the point where the Boise National Forest boundary intersects State Highway 20 near Dixie following the Boise National Forest boundary west and north along the ridge of the Danskin to Boise Front foothills and extending north encompassing the Idaho Department of Lands to its intersection back with the Boise National Forest boundary near Sagehen Reservoir. 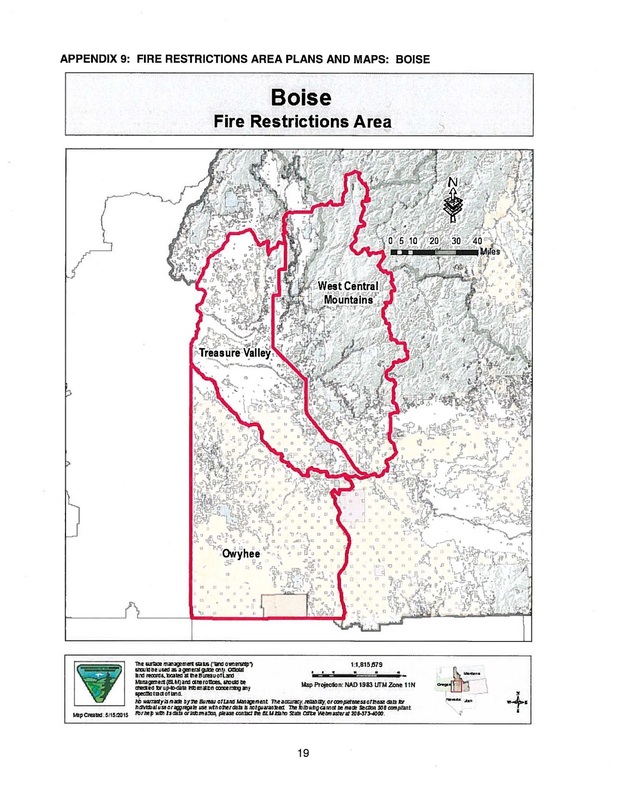 The far northern boundary includes all Boise National Forest lands, excluding the Frank Church River of No Return Wilderness. All lands north of Sagehen Reservoir including Tripod Mountain and West Mountain within the North Fork Payette River drainage north to near Tamarack Resort.